Could GCHQ crack Pablo’s Armchair Treasure Hunt? Possibly you have heard that GCHQ have issued a Christmas card with a puzzle. Solving the first puzzle leads to a series of further puzzles (word puzzles, maths puzzles and code-breaking) unless the extremely high interest means that the web server still can’t cope with the demand. This site heard about the hunt from Intervirals, though it was also widely covered in news programmes, not least a Sky News segment featuring BrainedUp.com‘s Dr. Gareth Moore. Excellent way to get tough puzzles back in the public eye. 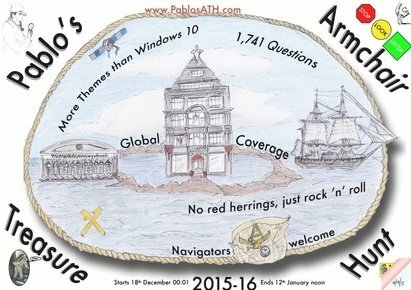 However, if this isn’t challenge enough for you, then in a week’s time, the 2015 edition of Pablo’s Armchair Treasure Hunt will begin. You can see a low-fi version of the hunt’s poster above; the official version is rather clearer and contains a number of clues and references which will portray some of the themes of this year’s event. The hunt itself will begin in a week’s time and will likely feature several dozen cryptic questions to solve, pictures to identify, connections to make, covert messages to discover and decrypt and doubtless much more, culminating in a physically hidden box in the south of England. The first team to discover the box wins a trophy; the team that best answers and explains all the references and hidden subtleties that have been put in place, within the month-and-a-bit time limit, also win a trophy. To get an appreciation for the form and conventions of the hunt, read through the thirty-year history of the hunt; the past hunts are available online along with their explanations, and make spectacular reading. An incredible labour of love! The old Logica hunts varied in difficulty and style over the years. It would be hard to pick a single year out of the archives and spend weeks solving it, just to get a feel for how they work. I recommend a similar puzzle as a sample, built in the same format by someone who has created puzzles for the real thing in the past. This one is shorter and easier — and doesn’t involve writing up an answer sheet or digging in freezing weather. Thank you very much for sharing the link! This does look like a more accessible starting-point, using some familiar techniques, yet surely has hidden depths beneath the surface.